This has been a most unusual week with heavy snow storms and freezing temperatures early in the week and today, Friday, when I drove home from work it was 63 degrees! I love coming home to enjoy the weekend. 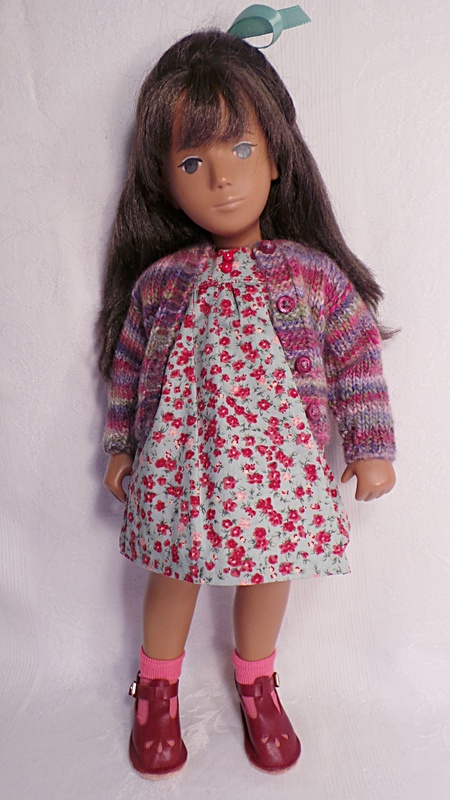 I took a few photos of Chloe wearing a pretty dress and sweater and both are from Shelly’s site. Her wonderful leather shoes are by Monica. 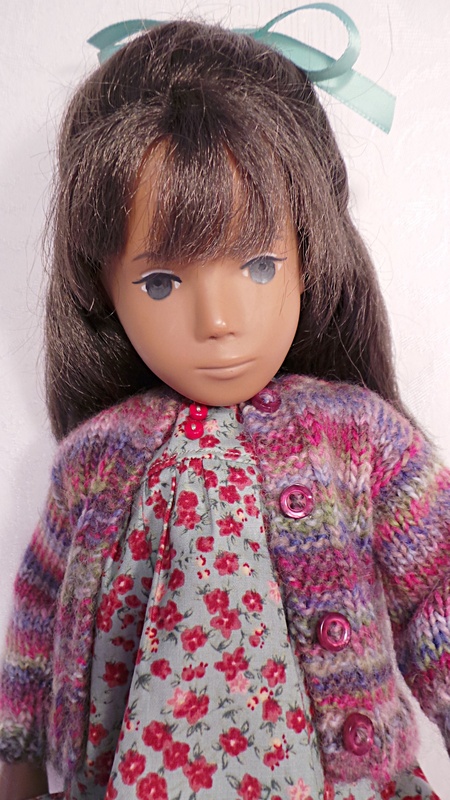 Chloe is a 1966 brunette early NP with large, dark blue eyes. I was so fortunate to adopt Chloe from a Sasha Mart member some years ago. Love Chloe and her dress and cardigan are such beautiful colours. She looks perfect in them. Hope the snow melts soon! Am I remembering correctly and that Chloe is your only brunette NP so far? 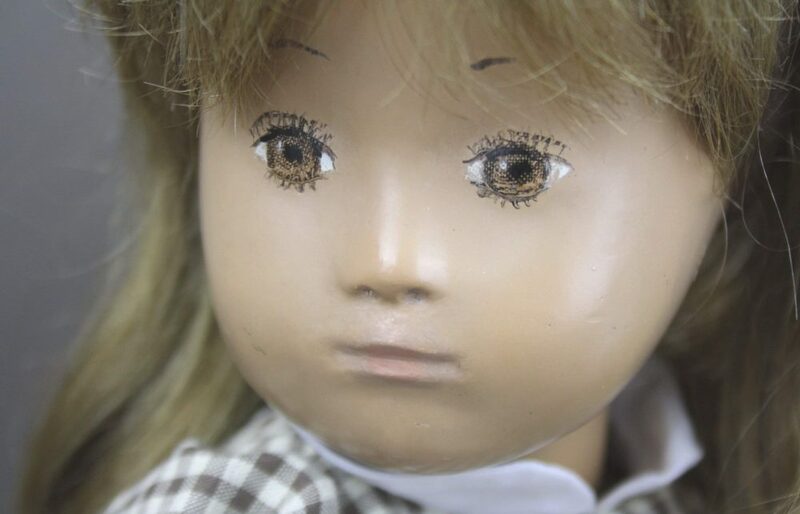 I love her big blue eyes in the ‘puddle/drop’ eyed painting style. Was she originally a blue Gingham girl? I remember seeing her dress for sale on Shelly’s and thought then just what a pretty colouring it was. I think that it is even more so now seeing it on Chloe. There are often some very desirable outfits on there….well,that is, if you can manage to get there on time before they are snapped up! Sorry to hear about the weather over there. Luckily we here in the UK are on the verge of Spring! Good morning Kendal! I suspect Chloe is a blue gingham girl. She came to me redressed. However, I have seen two other NPs on Shelly’s site that have Chloe’s eye painting and both of them were in their original gingham dresses. So I think she was most likely a gingham girl. 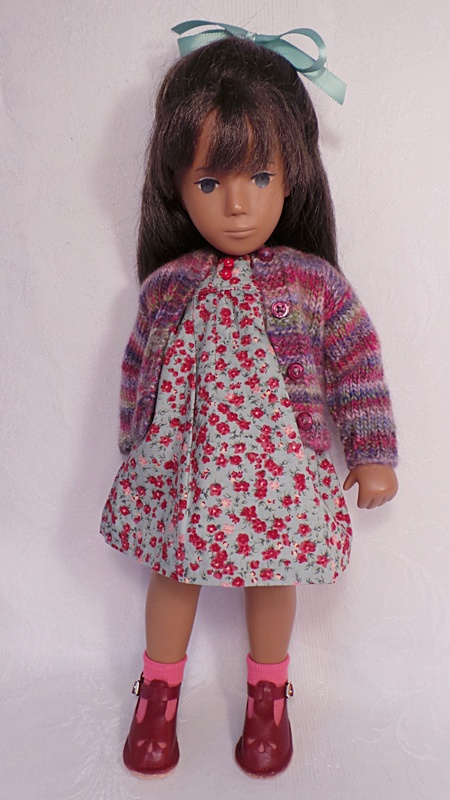 What a lovely girl Ginger, you do have some beautiful dollies in your collection, they are a pleasure to see on here! Chloe’s outfit is lovely too, she really suits the colours. I’m glad to hear that your weather has improved somewhat. I love looking at snow but have to say that I prefer to just see it, take a few photos because it makes lovely photos, and then for it to be gone. I don’t like driving or having to walk in it!!!! Give me summer and warmth any time! !